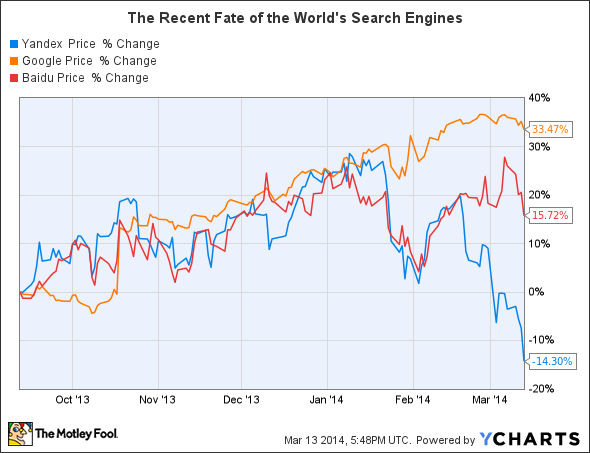 Which Search Engine Represents the Best Stock to Buy Now? You’ll Probably Be Surprised. Between Yandex, Google, and Baidu, one stands above the rest. If you're looking for the best stocks to buy now, you can be forgiven for having a tough time lately. The stock market just crossed the five-year mark of a historic bull market that's been a three-bagger after reinvesting dividends. The average stock in the S&P 500 now trades for about 20 times earnings, significantly more than the 13 times earnings it traded for in September of 2011, and well above the long-term average of 15.5. All of this is to say that people are feeling good about stocks, which ironically means that good deals are tough to find. In such a climate, it's best to look for companies that have solid moats, growing prospects, and quality management teams in place to ensure adaptability moving forward. So where are you supposed to invest that cash now? Few business models meet these criteria as uniformly as online search engines. Once built out, these companies enjoy fantastic economies of scale, loyal users who return over and over again, and a base of advertisers drooling to get their products in front of uniquely selected individuals. Three of the largest players in this industry right now are Google (NASDAQ:GOOGL), Baidu (NASDAQ:BIDU) and Yandex (NASDAQ:YNDX). When it comes to determining which of these are the best stocks to buy now I'll level with you: this article idea was supposed to be about what a great deal Russian search engine Yandex was after the company's stock sold off following rising tensions in the Ukraine. Indeed, if you were only going to look at how these stocks have fared over the past six months, Yandex appears to be a screaming deal. But once I dug underneath the surface, I found something that surprised me: Baidu, while having seen its stock double in the past 10 months, still represents a pretty solid purchase today. There's no denying the fact that all three of these companies are benefiting from more and more advertising dollars coming on-line. As it stood in 2012, a full 75% of U.S. advertising dollars were used for television, newspaper, magazine, and radio spots. Think about that: these are all -- at varying levels -- dying industries. Over time, more and more advertising money will migrate toward the Internet. And when it does, companies will be able to target their audience far better. No one knows more about what users are interested in than search engines, and they'll be the biggest beneficiaries over time. While Google is the industry giant, with 72% of all global search market-share, its revenue growth is understandably slower than that of its peers. In 2013, the company brought in 19% more cash than the year before. Yandex posted an impressive 37% bump, while Baidu -- stationed in mainland China -- sported a whopping 47% growth in revenue. Not only was Baidu's showing impressive, but over the next three years, analysts expect it to continue the trend. There are two key reasons for this growth. First, the economies that Baidu operates in are growing at a faster pace than the largest contributors to Google and Yandex. And second, there's a greater portion of the population coming on-line in Baidu's home markets than those of the other two. As you can see, the economies of China, South Korea and Hong Kong are all expected to grow at far faster paces than others. On top of that, even though Internet penetration in South Korea and Hong Kong are relatively high, China alone has 800 million citizens -- more than 10% of the world's population -- who have yet to use the Internet. Given these differences, one might assume that Baidu is assigned a much higher price tag than Yandex and Google. But this couldn't be further from the truth. Looking at two key metrics, all of these companies appear to be somewhat evenly priced. Given that disparity, Baidu actually looks like a great buy right now -- even though its stock has doubled in less than a year.